The vicinity to the coast has always been a decisive advantage for Pisa that the city knew how to deploy cleverly. Since the 11th century the sea republic had owned a powerful navy at the 13 km distant aperture of the river Arno. From there the Pisans went into the long-time battles between the Christian and the Islamic world. 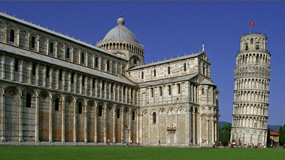 On this crusades Pisa was able to reel decisive victories. With their superior naval power they opened up new ways for maritime trade and founded various trading colonies in the Orient. Due to the created prosperity, Pisa could document a great artistic height between the 11th and the 13th century. Several architectural styles from the early Christian era, the Lombard-Romanic times and from the Arabic world unified in Pisa. The best and most impressive example for these times is the beautiful and world famous plaza „Piazza dei Miracoli”. The place of miracles unifies the cathedral, the baptistery, the cemetery and the Leaning Tower together with its art treasures and monuments to one of Italy´s most beautiful ensembles of churches. In the west of Pisa, along the 300 km long coastline of Tuscany, wide sandy beaches and rocky bays take turns. The popular and gentrified destinations Marina di Massa and Forte dei Marmi are located in the north and are mostly visited by Italian tourists. To the south of Pisa, broad and thick stone pinewoods seam the beaches. In between one can find scenic and medieval fishing villages like Castiglione della Pescaia. Here we are already located in the lowland of the Maremma in Tuscany a former malaria contaminated swampland. The heart of the area is the 200 square km great natural park Maremma that offers living space for deer, badgers, foxes, rabbits, hedgehogs and various birds. The best time to hike is certainly in the spring, when the colourful Macchia spreads its fragrant scent. Typical types of the Mediterranean bushes are rosemary, bays, myrtle, strawberries, gorse or rockrose but one will also find basswood and holm oak. 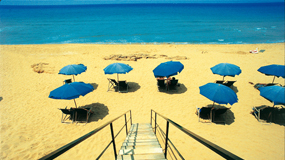 Various gazebos open up magnificent panoramic views over the broad coastline and the Tyrrhenian Sea. Seven dreamlike islands are located in these coastal waters that are one of the cleanest of the Mediterranean Sea. Together, the cliffy islands with their rocky coast form the Tuscan archipelago. 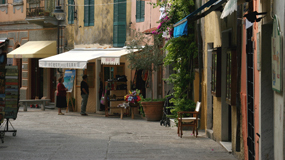 The most famous island of Tuscany is Elba. According to the legend they are a gift from the Tyrrhenian Venus. When she ascended from the sweeps of the sea, seven jewels loosened from her ornaments and eventually formed the islands. In 1996, 750 square km of this fascinating area were announced Parco Nazionale dell´ Arcipelago Toscana. The biggest island in the Tyrrhenian Sea is Elba with a size of 224 km2. From Piombino one can reach the island easily with a ferry since it is only 20 km off the coast. The mild climate and the countless sports activities turn Elba into a popular destination. The island provides beautiful tracks for bikers, hikers and horseback riders, amazing golf courses and the ideal weather for Para gliders. Starting with diving, surfing and sailing, Elba leaves nothing to be desired for water sports enthusiasts. In almost every town they offer diving courses and boat rental. Seaside vacationers will find their paradise in the many bays or at the numerous beaches with the turquoise water, like in Marina die Campo, the largest beach of the island. Besides lumps of rock Elba possesses a unique flora, which is coined by endless species of orchids. 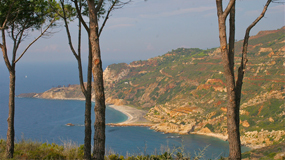 Therefore Elba also belongs to the national park of Tuscany. Vineyards and the highest mountain of the island, Mount Capane, are located in the heartland of Elba. A cable car leads up to the mountaintop, where one can enjoy the beautiful view over the island and the sea. The second largest island of the Tuscan archipelago is Giglio with a little more than 22 km2. There are ferry connections to the island from the peninsula Monte Argentario that is just 20 km away. The wild nature, the pine stone woods and the olive groves are very inviting for a hike or a walk. Several beaches and bays that cross the rocky coast, offers a paradise for seaside vacationers and scuba divers. The crystal clear water and the diversity of dazzling fish provide the perfect diving area. The mild and usually sunny climate of the island is a great premise for a day trip, where the unique nature of Giglio can be spotted. The island Capraia is located south of Gorgona and just a few km northwest of Elba. 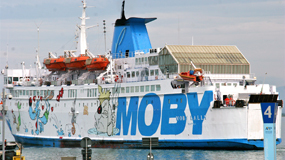 The transit with the ferry from Livorno takes approximately one and a half hours. With 20 km2 it is the third largest island of Tuscany and also known as a prison island. However nowadays this history is hard to perceive. Today the versatile and impressive nature offers a paradise for vacationers and divers that will find both recreation and adventure in the numerous bays. 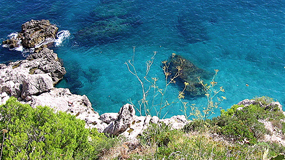 Capraia is also mountainous, belongs to the nature reserve and therefore offers many opportunities for hikers. Nature enthusiasts will find peace and quiet at the lake Laghetto, a freshwater lake in the middle of the island. The fresh scent of the countless flowers and herbs can be smelled all over the island. During the summer months tourists cavort in the small but lively town Capraia Isola and seize the chance to visit the famous fort that is built in the rock face. Owing to the novel „The Count of Monte Cristo”, the small island is now well known all over the world. Since Montecristo is a nature preserve, the world will never get to know the little introspective island. There is no ferry connection to the island and a minimum distance of one mile has to be remained around Montecristo. Scientist, explorers and educational visitors are allowed to the island only with a special permit and again with an extremely limited number. 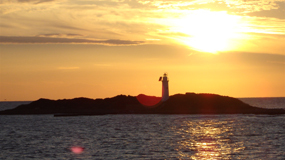 Hence the island is inaccessible for visitors, so the unique flora and fauna can be preserved and explored. 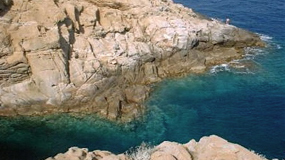 The northernmost island of the Tuscan archipelago is Gorgona. 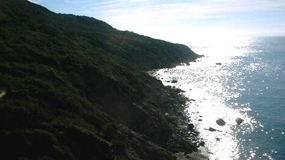 With a little more than 2 km2 it is one of the smallest islands of the Tyrrhenian Sea and is 37 km away from Livorno. From there one can reach the island by taking a ferry. A volcanic rock and various buildings of the Greeks, the Romans and the monks coin the scene of the island. A high-security prison, why the island can only be visited by a guided tour once a week, takes the major part of Gorgona. Another reason for the limited sightseeing is the breathtaking and unique flora and fauna, that for the most part can only be found on Gorgona, as well as some special archaeological finds. Parts of the island belong to the national park „Parco Nazionale dell´ Archipelago Toscano”. Almost 90 % of the land is covered with Mediterranean macchia, whereas 400 additional plant species found a home on the island. Due to the clear water, the most delicate fish of the region originate from Gorgona. Therefore shipping and tourism are partly constricted and partly prohibited in the area. The 10 sq-km wide island Pianosa is located 14 km south of Elba. Like most of the other islands of the Tuscan archipelago, Pianosa was a prison island as well. Compared to its neighbouring islands, Pianosa is very flat and by no means mountainous. However small white lumps of rock add a special flair to the island. The ruins of the palace in the bay Cala Giovanna, which is the only bay where bathing is permitted, the catacombs and the traces of the Romans offer many sights for tourists. 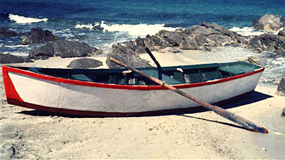 However the number of daily visitors is also limited on this island since Pianosa belongs to the nature reserve as well. The intact nature with its distinctive flora and fauna has been preserved apart of mass tourism due to the ban of boats and fishing. Another small island of the Tyrrhenian Sea is located in the south of Tuscany. The bicorn island Giannutri offers a breathtaking underwater world and therefore provides a paradise for diving and snorkelling, which is only permitted in a limited way since the island also belongs to the nature reservation. Grottos, sunken ships of the Romans and a very unique marine biotope are located in the clear water around Giannutri. Old ruins of ancient Roman villas are also obtained very well. Flora and fauna on the island are preserved by a strict ban of cars and are not affected by pollutant, so that plants and animals can roam freely and develop in the mild climate on Giannutri.